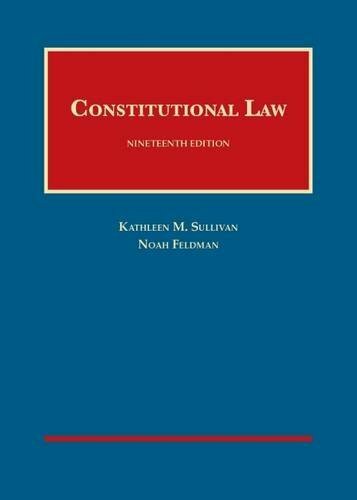 1634594479 -The Nineteenth Edition is an updated version of this classic casebook, adding new materials on the Supreme Court’s most recent decisions on federal power, free speech, equal protection and religious freedom to its existing comprehensive coverage of separation of powers, federalism, civil rights and civil liberties. This casebook provides a unique combination of clearly structured and lawyerly coverage of the cases with rich historical, theoretical, and philosophical materials that illuminate the development of our constitutional law. In the 19th edition, you will find the latest decisions on gay marriage, street signs and confederate flags, campaign contribution limits, congressional power over voting rights, and religious exemptions from health care mandates, among many others. The note materials and questions in the casebook make it easy to structure classes and promote lively discussion. And comparative examples from the constitutional law of other nations are provided throughout.